Today, more than four years into the recovery, capital market opportunities are shifting, with conditions in credit sectors such as high-yield corporate debt becoming a bit less attractive. However, the current cycle has different characteristics that suggest investors should not abandon credit strategies just yet. 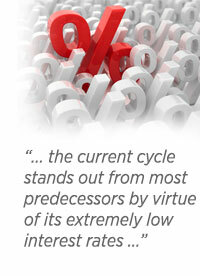 Let’s consider the features of a typical cycle, such as valuations, spreads, and balance sheets. First, by this point in the cycle, the valuations of high-yield credit relative to investment-grade bonds, which were separated by a wide chasm in 2008 and 2009, have narrowed considerably. Second, credit spreads have tightened, leaving credit sectors with a less impressive yield advantage over higher-quality issues. Third, we have begun to see a change in corporate behavior that often emerges to diminish the attractiveness of credit, as companies begin to issue debt in order to finance mergers and acquisitions. Greater debt issuance tends to weaken balance sheets, even as buying pressure supports equity prices. In the current cycle, we have seen only a partial narrowing of valuations and credit spreads, and corporations still sensitive to the pain of the 2008 financial crisis have been somewhat slower to turn to merger-and-acquisition activity. Also, the current cycle stands out from most predecessors by virtue of its extremely low interest rates and a dearth of nominal yields available to investors around the world. The hunt for yield that has been a hallmark of capital markets for several years is likely to be another factor extending the length of this credit cycle. 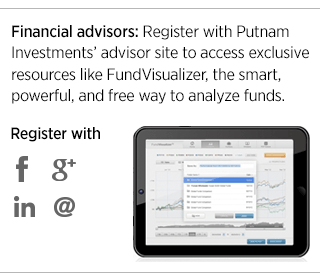 Read more of our thinking in Putnam Capital Markets Outlook.